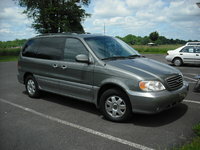 Start a new Kia Sedona question. When I turn the car off and remove the key, the throttle body plate flips open and closed for about 10 seconds. Is this bad or a sign that the part is going bad? Is this nothing to worry about? Improvising hold down clips for headlamp bulbs as they aren't made any more. Any tips? Do they need to be made of a conductive metal? 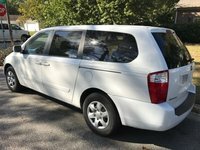 The Kia Sedona minivan has always excelled in the area of safety, earning top ratings from the NHTSA and the Insurance Institute. 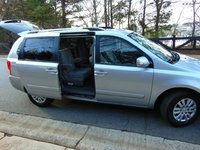 Touted as the safest minivan in America, it also offers excellent quality, power, and capacity -- all attractive options to a family on a budget. 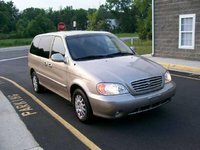 Introduced in 2002, the first Sedona attempted to compete with the Odyssey and Sienna, but lacked many desired features in a minivan, such as flat-fold seats and a power sliding door. The absence of these features kept the price tag down, but deterred those looking for more convenience and access for families. The first Sedona was also very heavy, and although it had a powerful 3.5 V6 engine, it struggled on acceleration or when loaded up with cargo or passengers. It came in two trim levels, base LX and sportier EX, with three rows of seats. A needed redesign in 2005 added inches and height to the Kia Sedona, increasing head and legroom overall. It also smartly added power sliding doors and tailgate, rear parking sensors, and flat-folding third row seats, bringing the minivan into better line with its competition. A more powerful 3.8 V6 now gets 250-hp, making the Sedona a good performer on the road with towing capabilities as well. In terms of safety, it still beats out other minivans with its standard six airbags, traction control, stability control, and ABS brakes. 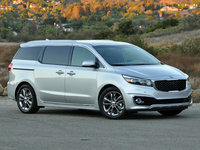 Though the price tag has creeped up, families looking for a reliable, quality, comfortable minivan are drawn to the Kia Sedona.